Lithuanian rabbi; born at Brest-Litovsk in 1615; died at Zolkiev Jan. 3, 1690. After he had studied under Hirsh Darshan, Hillel went to Wilna, where from 1650 to 1651 he was a member of the rabbinical college. He stayed at Wilna until 1666, then became rabbi in Kaidani and several other Lithuanian towns, was called in 1670 as rabbi to Altona and Hamburg, and in 1680 to Zolkiev. He was also a delegate to the Council of the Four Lands at the fair of Yaroslav. 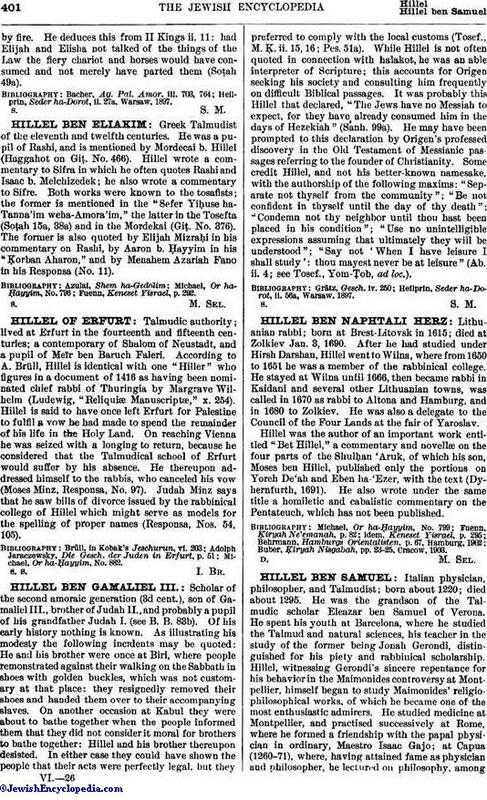 Hillel was the author of an important work entitled "Bet Hillel," a commentary and novellæ on the four parts of the Shulḥan 'Aruk, of which his son, Moses ben Hillel, published only the portions on Yoreh De'ah and Eben ha-'Ezer, with the text (Dyhernfurth, 1691). He also wrote under the same title a homiletic and cabalistic commentary on the Pentateuch, which has not been published. Buber, Ḳiryah Nisgabah, pp. 23-25, Cracow, 1903.